Spondylolisthesis is a spinal condition that involves the slipping of one spinal vertebra over the one immediately underneath it. In order to understand this condition, and a related condition called spondylolysis, which is a precursor for some types of spondylolisthesis, it is important to review the components of the spine and how they function. Providing platforms for attachments of many muscles and ligaments that traverse the skull, the thorax, and the pelvis. Permitting the trunk of the body to have appreciable flexibility of movement, such as twisting, bending, or arching the back. Protecting the spinal cord while providing openings between adjacent vertebrae for the passage of spinal nerves. 7 cervical vertebrae which form the upper part of the spine between the skull and the chest. 12 thoracic vertebrae which are found between the upper chest and lower back. 5 lumbar vertebrae which form the lower back and are the largest and strongest of the vertebrae. They are the source of attachment of many strong back muscles. 5 vertebrae fused together form the sacrum, which is triangular in shape and connects the spine to the pelvis. The sacrum also provides support for the spine. 4 fused vertebrae form the coccyx ("tail bone") which has little known function. If you or a loved one has been diagnosed with spondylolisthesis, it's critical to learn everything you possibly can about this condition so that you can make informed decisions about your treatment. That's why we created the Medifocus Guidebook on Spondylolisthesis, a comprehensive 168 page patient Guidebook that contains vital information about spondylolisthesis that you won't find anywhere in a single source. The underlying causes of spondylolisthesis. The relationship between a condition known as spondylolysis and the development of isthmic spondylolisthesis - the most common type of spondylolisthesis observed. A description of the Meyerding grading system that is used by doctors to determine the degree (severity) of slippage in people with spondylolisthesis. Using this grading system, patients may be classified into either low-grade or high-grade slippage groups, which serves as an important basis for planning an appropriate course of treatment. How spondylolisthesis is diagnosed based on factors such as signs/symptoms, patient history, physical examination, neurological evaluation, and radiological (imaging) studies. The medications that are often prescribed to alleviate back pain in patients with spondylolisthesis. The risks, benefits, and complications that are associated with the various surgical techniques for spondylolisthesis. The prognosis (outlook) for people with spondylolisthesis including the important factors that can have a significant impact in predicting the overall chances of recovery. The impact of spondylolisthesis on the patient's quality of life, including practical tips and suggestions for how to minimize the impact on your lifestyle and better cope with the condition. Important questions to ask your doctor about spondylolisthesis. A Guide to Recent Medical Literature on Spondylolisthesis - This section of the Guidebook contains an extensive bibliography of over 100 references to recently published articles about Spondylolisthesis in authoritative, peer-reviewed medical journals with links to the absracts (summaries) of the articles. These articles represent the latest advances in the field and focus on cutting-edge research, new developments, and the lessons learned from recently published clinical trials involving patients with Spondylolisthesis. This is the same level of that is used by doctors who treat people with Spondylolisthesis to keep abreast of the latest developments and breakthroughs in this specialized field of medicine. Centers of Research for Spondylolisthesis - We've compiled a unique directory of doctors, hospitals, medical centers, and research institutions with special interest and, in many cases, clinical expertise in managing people with Spondylolisthesis. The "Centers of Research" directory is a valuable resource for quickly identifying and locating leading medical authorities and medical institutions both within the United States and other countries who are considered to be at the forefront in clinical research and treatment of Spondylolisthesis. You'd have to spend days - or even weeks - attempting to compile your own list of doctors and medical centers but, with the "Centers of Research" directory, the information is already right at your fingertips. All you have to do is act on the information by selecting and contacting the experts or medical institutions listed in the directory by state and country. 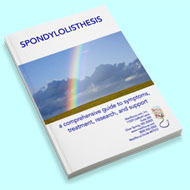 Organizations and Support Groups for Spondylolisthesis - The Guidebook also includes a directory of organizations and support groups whose goal is to help people with Spondylolisthesis by providing access to information, resources, and services. Many of these organizations can answer your specific questions, enable you to "network" with other patients, and provide guidance in areas such as financial, social, or medical-legal issues. This valuable directory of organizations and support groups includes complete contact information, including phone numbers and E-mail addresses. Free Updates for One Year - Along with your initial purchase of the Guidebook, you also receive free updates for one-full year. 20% Discount - For a limited time, you can purchase the Medifocus Guidebook on Spondylolisthesis at a special 20% discount off the regular list price. Your 20% discount will automatically be applied when you go to "Checkout". Risk-Free Satisfaction Guarantee - Your purchase comes with our RISK-FREE satisfaction guarantee. If, for whatever reason, you are not totally satisfied with the content of your Guidebook, simply contact us within 30-days of your purchase for a prompt, full refund. We are so confident that you will be satisfied with your Guidebook that we offer this RISK-FREE satisfaction guarantee unconditionally - no questions and no hassles. Order Your Copy of the Medifocus Guidebook on Spondylolisthesis Today! Answers to your critical health questions including the latest treatments, clinical trials, and expert research. High Quality, Professional level information you can trust and understand culled from the latest peer-reviewed journals. Timely, up to date content with free guidebook updates for 1 year. A unique resource to find leading experts, institutions, and support organizations including contact information and hyperlinks. The Medifocus Guidebook on Spondylolisthesis is available in the following two convenient formats: Printed and Digital. Call Toll Free in the U.S.
You can also receive a 20% discount when you order your Guidebook by phone. To receive your 20% discount, simply mention the Discount Coupon Code below to the customer service representative taking your order. "The MediFocus Guidebook on Spondylolisthesis provided me with the information I needed to make an informed decision regarding my treatment. The Guidebook clearly explained the various grades of spondylolisthesis and what patients can expect at each stage. The various treatment options are also clearly explained so that you walk away with a much more realistic expectation about what to expect after treatment." "The MediFocus Guidebook on Spondylolisthesis enabled me to have a more meaningful and serious discussion with my Orthopedic Surgeon about the various treatment options that are available to me. Your very comprehensive and informative Guidebook not only helped me prepare the right questions to ask my surgeon but also helped me better understand the answers he provided." "Your MediFocus Guidebook on Spondylolisthesis helped me to prepare important questions to ask my doctors about the risks and complications associated with the proposed surgical solution to my low back problem. Thank you."